All proposals should include the following information. Please copy and paste the following questions into a word document and email them to Anne Hromadka (amhromadka@msn.com). Submissions are accepted on a rolling basis. Please note, each participating artist will have the opportunity to present their project during the SEDER event. Artists who submit must be present at the event. If your presentation requires special equipment or has space needs exceeding a 2’ x 2’ area you must tell the SEDER Organizers at least one week in advance. 7. Why is this project critical? 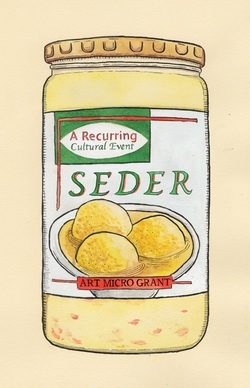 Please prepare at least 2 visuals to share the night of the SEDER event. These materials should illustrate your concept. They can include sketches and/or images of similar previous work. Please include at least 2 High Resolution Jpegs with your submission.